If anything piques our travel radar, it’s exploring the many off-the beaten-path travel destinations located throughout the American Southwest. 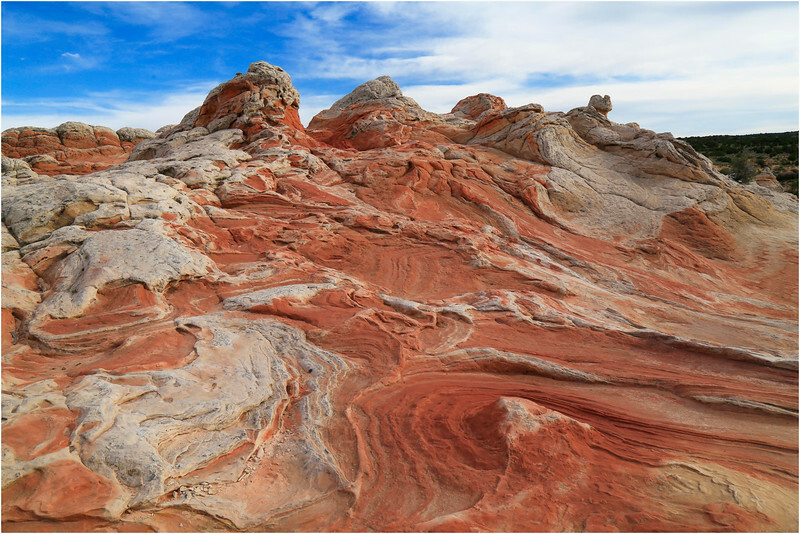 Guest writer, Bill Haskamp, is here to tell us all about one of the most remarkable and isolated sites in Vermillion Cliffs National Monument as we go exploring White Pocket, Arizona. By way of introduction, I’m an early boomer who was born and raised in Minnesota. My parents had very itchy feet, so my sister and I were introduced early in life to road tripping. My job after college entailed a lot of travel, and despite long hours, afforded the opportunity to see many places in this beautiful land of ours. I opened the door to retirement as soon as my better half and I could afford it. While we had our choice of any location to winter in, only Arizona stood out when considering cost, climate, travel, and opportunities with a plethora of possibilities for hiking, and photography. We live part time there in a very vibrant retirement community with a host of activities that includes college classes and numerous clubs, especially an active photography club. Each year in the photography club there are opportunities for field photo shoots, some easy, some quite rigorous. This year’s most rigorous field trip was a trip to the White Pocket, a spectacular, and world famous portion of the South Coyote Section of the Vermilion Cliffs National Monument. World famous is a pretty strong claim, but we ran into two different parties from Europe that were hiking there. 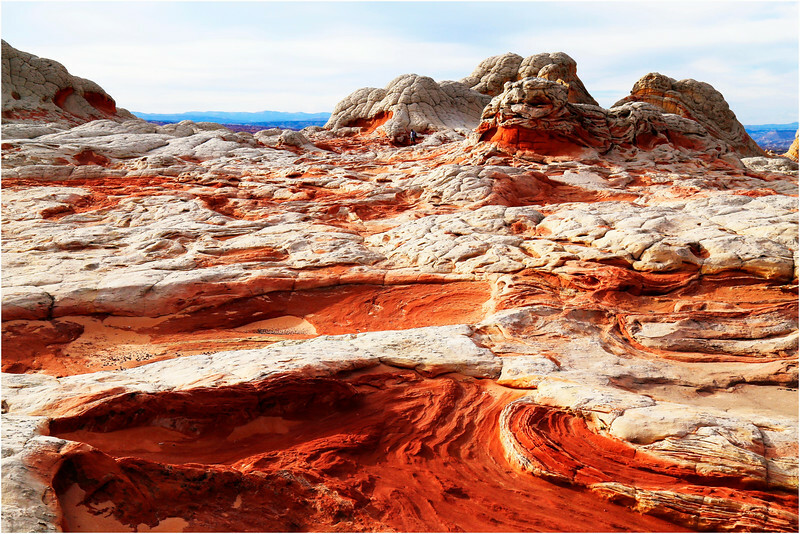 The White Pocket is only one of several very unique landforms in the area, which includes the very famous Wave, Wire Pass, Buckskin Gulch, and the Nautilus. Buckskin Gulch, for example, is said to be the longest slot canyon in the world. These areas, some of which require a Bureau of Land Management (BLM) permit, are remote. Most require diligent preparation, for this is a very beautiful but harsh and unforgiving land. How do you get to White Pocket? The Vermillion Cliffs National Monument lies very close to the Arizona-Utah border. The closest cities are Page, Arizona and Kanab, Utah. While the reader can easily lay out a route from Phoenix, Las Vegas, or Salt Lake City, the route we took from Phoenix has plenty of other points of interest that caused us to stop and ponder along the way. Leaving highway 89 for a short side trip up Highway 64 takes you to the Little Colorado Canyon overlook. 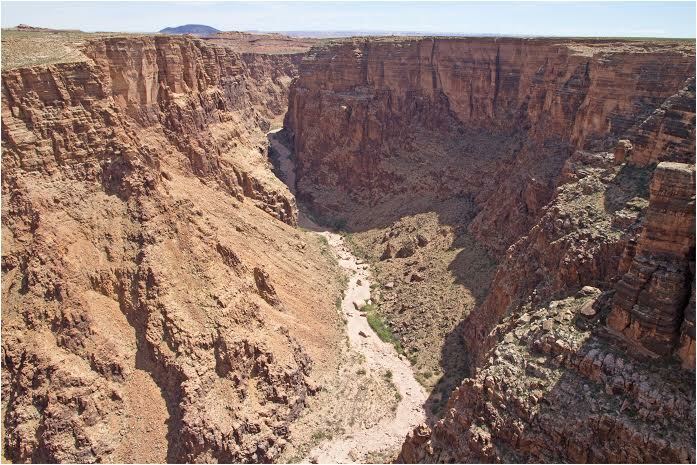 The Little Colorado River drains the vast Painted Desert area, and regrettably was completely dry, the result of the extended drought in the Southwest. There are numerous stands at the overlook featuring Navajo jewelry and pottery that you can buy without extra middleman charges. The Navajo proprietors will gladly explain each item of jewelry or pottery for your edification. If you want, you can continue up Highway 64 all the way to the South Rim of the Grand Canyon (my favorite route), but for now, we’ll head back to Highway 89 and continue up to the Cameron Trading Post which is an excellent gas and lunch stop. Their platter-sized Navajo Taco has to be seen to be believed, and is best if shared. Continuing onwards, you can follow the road all the way to Page, where there are plentiful places to stay, or leave Highway 89 at Bitter Springs for Highway 89A. This route takes you to the Vermillion Cliffs proper, Navajo Bridge (featuring some rare California condors flying and roosting nearby), and Lee’s Ferry, the only crossing of the Colorado River for hundreds of miles. After visiting Lee’s Ferry, we continued south a small distance to our motel, the Cliff Dweller’s Lodge. While it may not look like much on your browser, it is a clean and comfortable motel with a very friendly and caring staff, a good restaurant, bar and gas pump, and offers proximity to the ramparts of the Vermillion Cliffs, which are a photographic gem in the early morning and evening light. 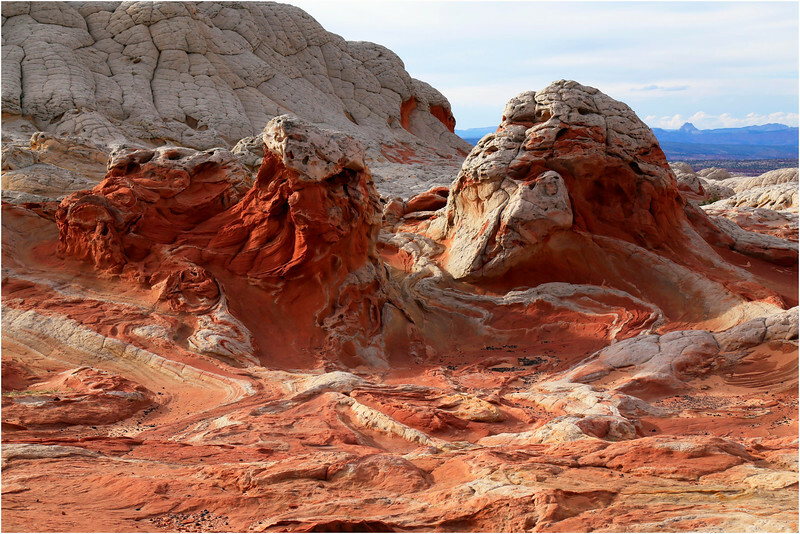 What time of year is best to visit White Pocket? As any good boomer traveler worth his salt knows, you go whenever you can, but environmental considerations are at play here. First, while the beautiful Arizona skies are almost always sunny and bright, the high temps and low humidity will take their toll on an unprepared human, sometimes fatally. Spring is a delight, especially when a wildflower bloom is in full swing. Summer can be brutal, highs in the 90’s will quickly sap a person not adequately protected. Fall features moderating temps and less traffic as school is back in session. Our trip in late April-early May happened to occur with a very nice wildflower bloom due to a recent shower. 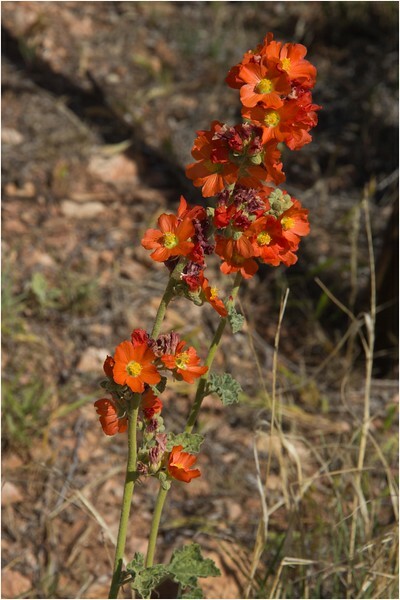 The high desert really can surprise a non-native when it blooms with whole fields of Globe Mallow and varieties of cactus. Regardless of the season however, a wide-brimmed hat, long sleeves, sunscreen, and plenty of water, or Gatorade is absolutely necessary. Staying hydrated and replenishing your electrolytes is necessary to keep going. Should you take a White Pocket tour or go on your own? The trip to the White Pocket is fraught with problems and danger. A high clearance, 4WD drive vehicle is necessary, along with the skill to handle very rough roads and deep sand. Despite traveling as we did with experienced outfitters, one of the guides buried a 4WD pickup to the frame in the soft sand and had to be winched out. Should you be foolhardy enough to try it yourself, a shovel, tire treads, a jack, and wide tires would be the minimum equipment necessary to have along. The internet has plenty of information on the details of how to get there, but we chose an accomplished guide to get our party of 19 there and back, set up a camp and provide dinner for us. Two stellar guide services are Kyle Walker, owner of Grand Circle Tours, and Yermo, owner of Seeking Treasure Adventures. Both will arrange pick-up in Page and Kanab and take you into the White Pocket, and stay with you until you want to leave, ensuring your safe arrival and departure, as well as watching over you, in case of dehydration or injury. Both of these outfitters run clean and safe outfits, and do their utmost to ensure your safety and help you have a successful trip. First-timers would be well advised to obtain the services of a guide. 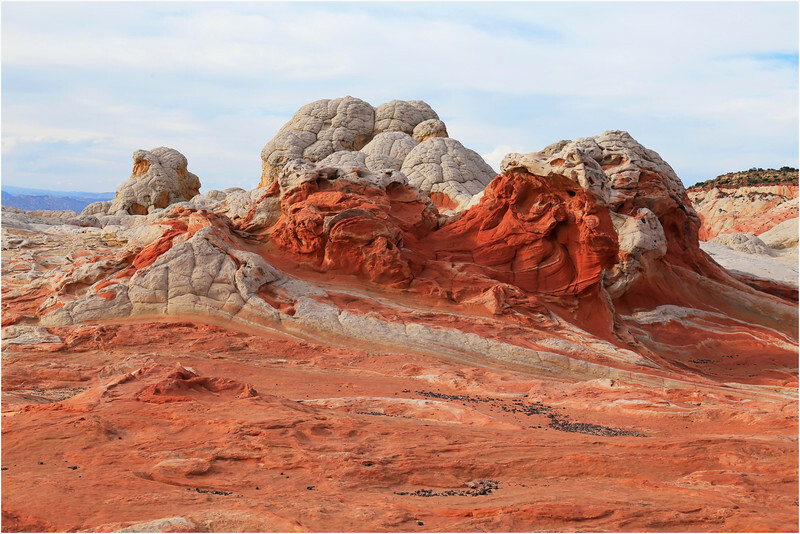 What is there to see in White Pocket? It’s easy to go crazy with the beautiful and overwhelming scenery, so be sure to slow down, compose your shots, make sure your images are properly exposed, and carry lots of memory cards. Your guide will help you a lot in that respect. The White Pocket is difficult and somewhat expensive to get to. This trip of a lifetime deserves some photographic memories that can go on your wall. While you’re there, pause frequently to contemplate the beauty and gaze in wonder at what geological events could have formed this area. Really, slow down, keep your cell phone in the vehicle since there is no service and no way to charge it, and let the place speak to you in its own way. You’ll come back filled with memories and energized by your adventure. 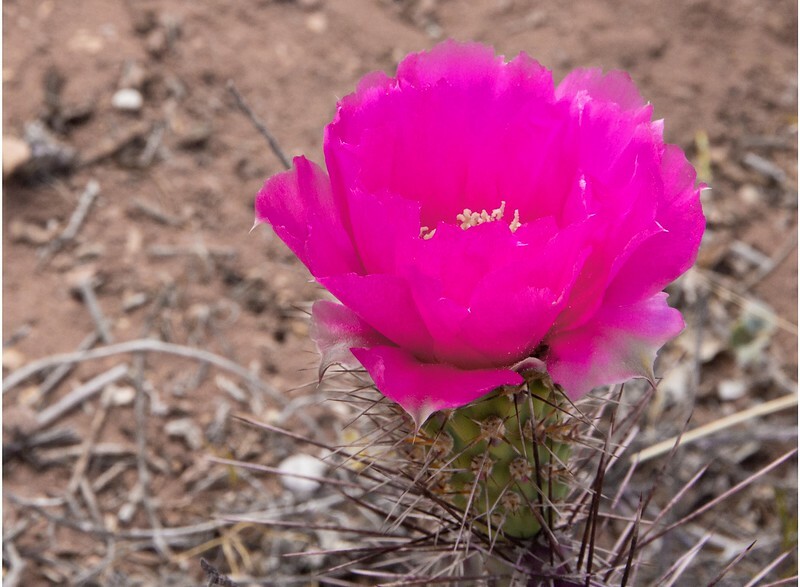 What else is there to see near White Pocket? Once you are safely out of the White Pocket, your adventure tastebuds may not be quite sated; you might be ready for more. There are a host of other spots to see in the area, testimony to how special this area is. We visited the Wire Pass Trail and Buckskin Gulch, as well as the Nautilus. The guides listed above are more than willing to show you around, and their prices are very reasonable considering the beating their vehicles take in this area. Less rigorous adventures to enjoy afterwards include boating on Lake Powell, or touring the slot canyons near Page, or visiting the granddaddy of them all, the Grand Canyon. One visit to this great area will almost certainly bring you back for more.